Go on YouTube these days and it’s fairly certain you’ll find a lot (probably even millions) of videos featuring dogs. Many of them showcase dogs doing cute and funny things, but quit a few are also about the tricks some dogs can do. So it’s natural for some people to think that all dog training is all about teaching a dog tricks. But in reality, dog training isn’t really about tricks at all. It’s not really about curbing misbehavior and destructive habits. It’s not about ensuring absolute obedience. Those may be important, but that’s not the very root and foundation of dog obedience training. The truth of the matter is that dog training is really about forging a successful relationship with your dog. This isn’t just any relationship though. It should be a relationship that’s based on love and trust. It shouldn’t be founded on fear and intimidation. It’s why having a pet dog is like adopting a new member of a family. It’s not like hiring a new employee for security, even if you do find it helpful to have a guard dog around the house. The main problem with having a dog, on the other hand, is that owners seldom have any idea on how to go about with fostering a proper relationship with their pet dog. Owners are prone to make mistakes, since they’re not really always knowledgeable on what to do. That’s where dog trainers come in. 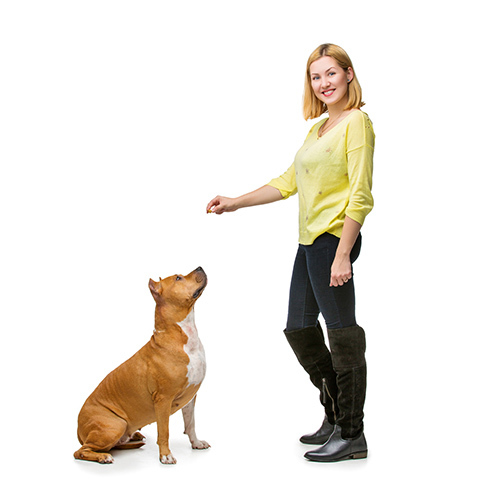 The best dog trainers are experts in getting the dog to behave properly. They tend to have the patience for this sort of thing, and they’re experienced in behaving as a dominant pack member so that the dog will respect them. With the right dog trainer and enough time, even the most ill-behaved dog can become a model of obedience and good manners. The trick, however, is to transfer the dog’s respect for the dog into respect for you as the owner. That’s not always easy. In fact, it’s not uncommon for a dog to revert to their old ill-mannered form when they get back with their real owner. That’s because you’re different from the trainer, and it’s very likely that your dog will regard you differently as well. That’s why the most effective type of training isn’t just with the dog, but with the owner too. The owner will also need to learn how to train a dog by themselves, because a dog trainer can’t be there all the time. If you’re the owner, you also need how to behave properly so that your dog will view you as higher in the pack hierarchy. That’s just how dogs think, and you have to adjust for it. It’s this problem of transferring the dog’s respect for the trainer to respect for the owner which explains the effectiveness of online dog training. Obviously when you go online you can have your pick of trainer from all over the world. You’re not limited to the trainers in your neighborhood. But the most important facet of online training is that if you’re the owner, you have no choice but to learn how to train a dog by yourself. There’s no choice in the matter. It’s not as if you can force a dog to stand in front of a PC monitor and learn obedience from long distance. It’s not true at all that you can’t teach old dogs new tricks. On the hand, it is a bit more difficult to correct longstanding habits in older dogs. It’s better to start with proper puppy training so that by the time they become adults they’re very well-behaved with good habits all around. One of the most important facets of early training is about how to potty train a puppy. There’s no need to list all the reasons why this is a good idea—if you’re an owner, having a dog that poops anywhere they want is quite frustrating. But this isn’t the only important part of puppy training. Another major part is about socializing with other people and go that you don’t get a Jekyll and Hyde dog who’s nice to you and mean (or fearful) with everyone else. It does and it doesn’t. It’s true that any breed of dog can learn proper behavior, regardless of their size. It’s also true that you should expect the same sort of good behavior from your dog whether they’re big or small. If you don’t tolerate a big dog jumping on you, then you shouldn’t allow small dogs to behave that way too. On the other hand, you do have to tailor your training methods to the size of the dog. If you have a small dog, you need to accommodate how they view the world differently. You may want to sit down when you’re training a small dog or a puppy, so that you don’t appear too intimidating. Also, you save yourself from back pain! The size of treats and toys will also have to match the size of your dog. Smaller dogs need smaller treats and toys. You can buy dog toys that can help engage your dog when you’re not around. Chewing toys are especially useful as these can spare your furniture from damage. Some toys are great distractions, others are for comfort, and some toys are treated as “prey”. Just make sure that the toys you get are “dogproof” and safe, which means it shouldn’t be a choking hazard. You may also want something that can endure rough treatment. There are also some training tools that help with behavior modification and training. Many people use crate training for pups, while some even use shock collars and other negative reinforcement tools. This is a rather controversial topic, because some of these tools can be regarded as cruel. Most experts agree that the best methods and tools emphasize gentleness instead of punishment for dogs. With punishment, your dog can learn to fear you and that’s not really the best sort of relationship to have with your dog. Remember, it’s all about love and trust and for that positive reinforcement—like affectionate acts and soft words—works best.